Toni Bou (Weltmeister) und Takahisa Fujinami (Repsol Montesa) im Honda Europa Hauptquartier. 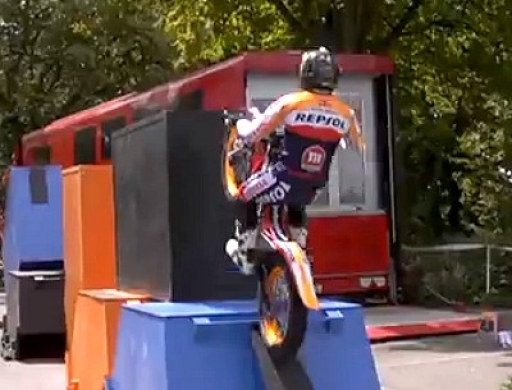 Twelve-time world champion, Toni Bou, and Takahisa Fujinami of the Repsol Montesa Honda World Trials team stunned staff at Honda Europe's headquarters in the UK, en route home from the final round of the 2012 Outdoor World Trials Championship in Cumbria. It almost goes without saying that Bou won the event, having secured his sixth successive Outdoor title earlier this month at the last round in Italy. A sixth Outdoor title to go with his sixth successive Indoor title, which he won earlier this year. Along with team-mate and 2004 world champion, Fujinami - or 'Fuji-gas' as the Japanese ace is affectionately known - Bou arrived at Honda's offices yesterday and began a stunning display indoors in the reception area before taking his Repsol Montesa Honda competition machine outside to a set of specially-constructed obstacles in the company car park. It proved to be a highly popular lunchtime distraction for the Honda staff, virtually all of whom tried to grab the best vantage point from which to view the Bou-Fujinami show.